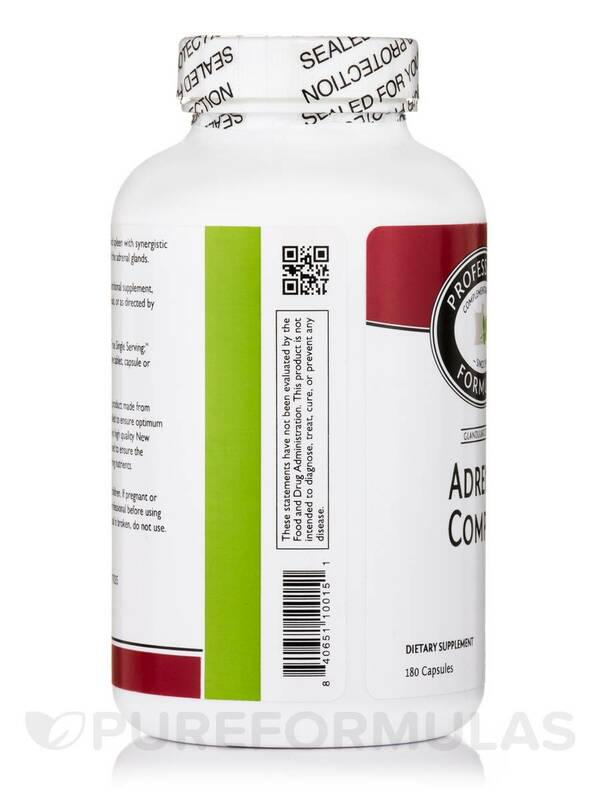 Adrenal Complex by Professional Formulas works great for supporting adrenals! About same price as NPs office and dont have to travel to pick it up. Thanks Pureformulas! Adrenal Complex by Professional Formulas is the same product that was prescribed by natural doctor great to find it here. Indications: Lyphilized adrenal and spleen with synergistic co-factors for proper functioning of the adrenal glands. Scientifically formulated nutritional product made from superior ingredients; quality controlled to ensure optimum potency‚ safety and efficacy. Contains high quality New Zealand glandulars carefully processed to ensure the bioavailability of intact gland-occurring nutrients. *Percent of Daily Values (DV) are based on a 2‚000 calorie diet. 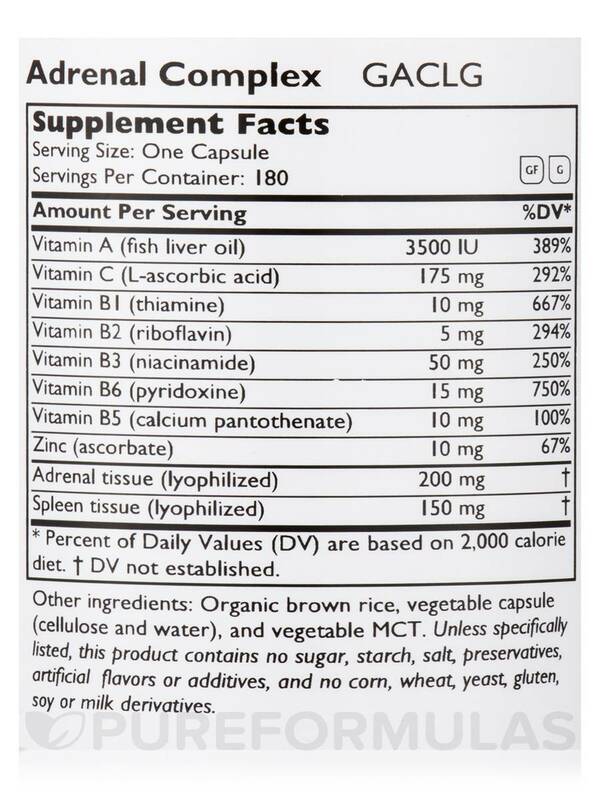 Other Ingredients: Organic brown rice‚ vegetable capsule (cellulose and water)‚ and vegetable MCT. 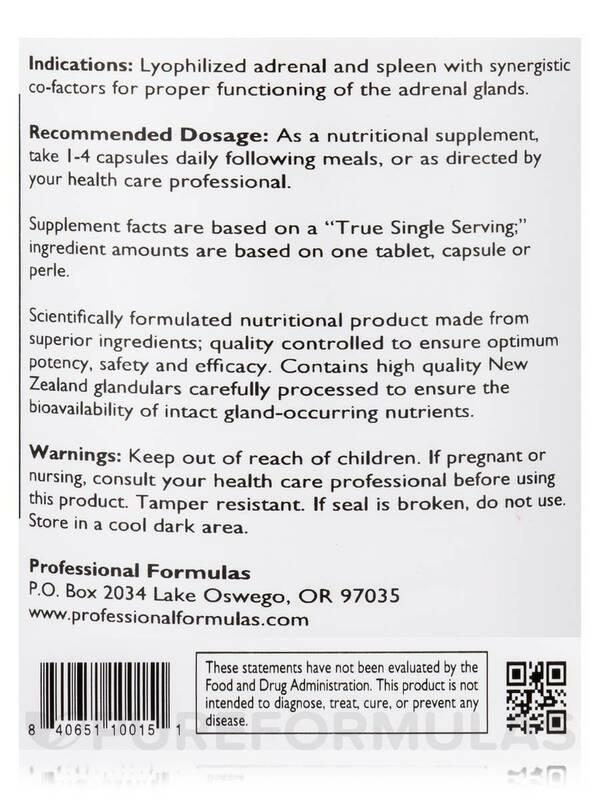 As a nutritional supplement‚ take 1-4 capsules daily following meals‚ or as directed by your healthcare professional. Keep out of reach of children. If pregnant or nursing‚ consult your healthcare professional before using this product. Tamper resistant. If seal is broken‚ do not use. Store in a cool‚ dark area. For professional use only. I have low cortisol levels. Adrenal Complex by Professional Formulas makes me tired all the time. A natural nutrionalist recommended this to me. It really helps to not have the mid afternoon lull. I take 1 in the AM and 1 in the early afternoon. Works great! 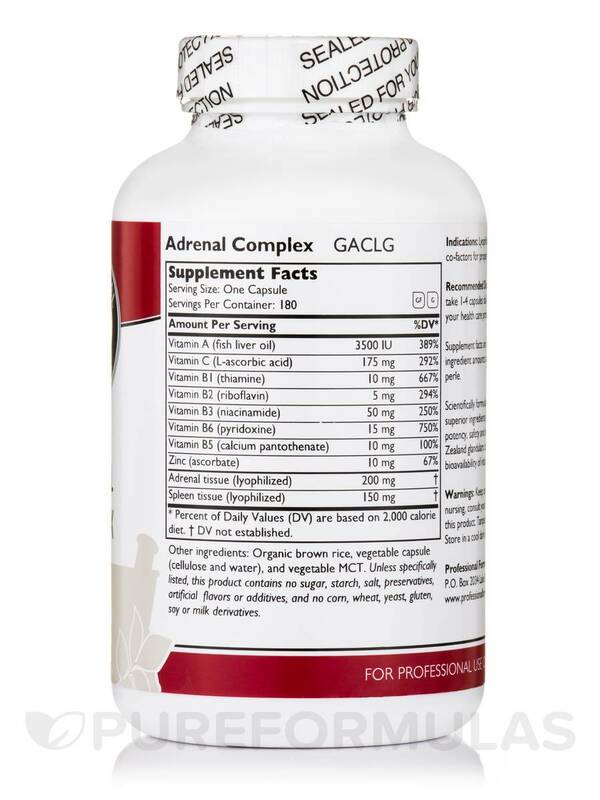 Adrenal Complex by Professional Formulas is the product recommended by my ND for adrenal fatigue, for the same price as at his office. It is the principle part of my adrenal recovery program, and makes such a difference. 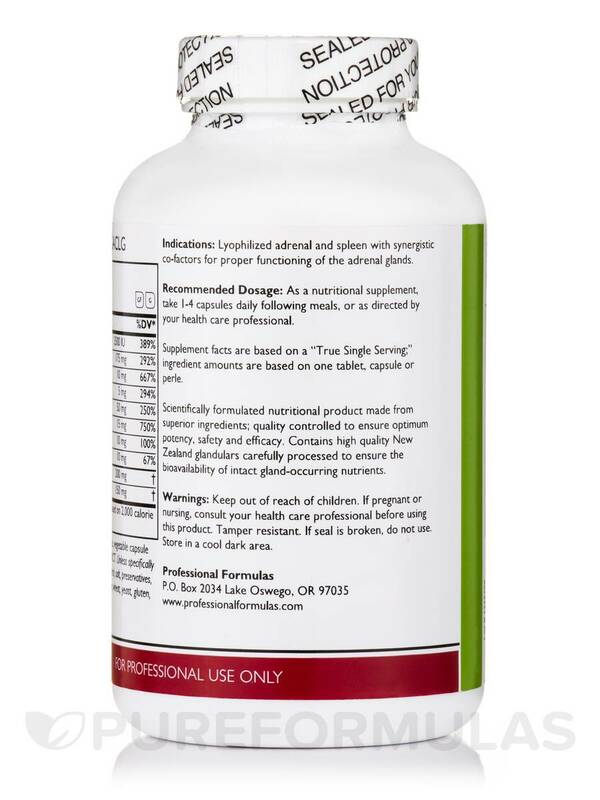 While I do not believe that Adrenal Complex by Professional Formulas was intended on weight loss, I have lost about 10 pounds since starting this. I believe the reason is that my adrenal system was so depleted & not functioning properly. I believe this has helped tremendously with my energy and metabolism. Doctor recommended Adrenal Complex by Professional Formulas. Works great! 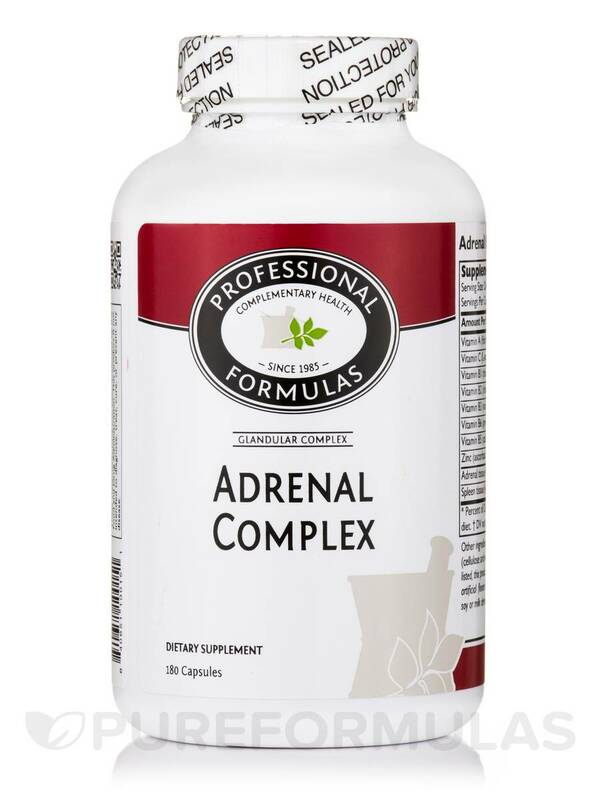 Adrenal Complex by Professional Formulas gives me the energy I need. Without it, I feel sleepy, sluggish, and nauseous. When taking this supplement regularly, I feel normal and healthy again. My ND recommended Adrenal Complex by Professional Formulas. I have a pretty sensitive digestive track and I tolerate it well. I take 1 in the morning and 1 in the afternoon with meals. Will be taking another cortisol text in a few months to see how it's working. I'm working on multiple levels to improve fatigue, not just taking this supplement. But..., with that said, it does seem to make a difference if I forget a dose. Easy to digest, seems to help fatigue/balance. Wish the price was a bit less, but it is a good price through Pureformulas.com. This is really helping me! Helps energy prevents the big crashes. Same price as NP office. Only reason I would not recommend to a friend is I feel this is something that needs to be recommended by a NP and then I would hands down. Wish I had to take less but goes with the territory.